This 1.5 CME MRI safety course is ideal for emergency physicians, oncologists, EMS, nurses, and other healthcare workers that must enter the MRI environment. 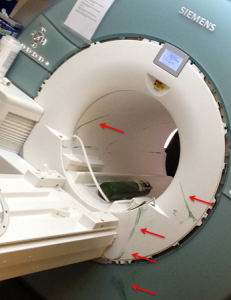 The dangers of MRI are invisible and often underappreciated. After completing this course you will understand how to work safely and responsibly and care for patients in the MRI environment. Physicians, MRI nurses, and MRI technologists who monitor patients or supervise employees in and around the MR scan room require a higher level of MR Safety Training. Comprehensive MRI Safety for Level 2 MR Personnel provides this training for specialists such as anesthesiologist, radiologists, and other healthcare providers. The safety hazards and risks associated with the MRI environment are very different from those typically associated with medical imaging, which are related to ionizing radiation. Physicians are often unaware of these risks or underestimate them as they are invisible and cannot be seen, heard, or touched. All Level 2 MR personnel should complete MRI Safety Training on an annual basis [American College of Radiology Expert Panel on MR Safety, 2013]. Standard EC.02.01.01 in the Joint Commission Diagnostic Imaging Requirements requires that healthcare organizations manage MRI safety risks by restricting access to the MRI environment to those who have been trained in MRI safety, and requires training on managing patient-specific risks for those who care for patients in the MRI environment, including the magnet room. This course is available for institutional subscriptions only. Click here for more information.